VAO President Board of Directors David Semless, Camden County Freeholder Jonathan Young, Sr., Voorhees Township Mayor Michael Mignogna and VAO Marketing Director Jennifer Bailey officially break ground on the VAO’s new building. VAO Marketing Director Jennifer Bailey, left, and President of the VAO Board of Directors David Semless, right, celebrate a $100,000 donation towards the VAO’s capital campaign of a new building by VAO volunteer and donor Barbara Patrizzi. 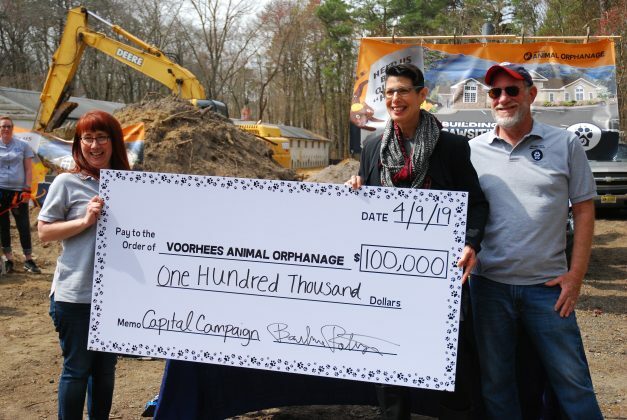 The Voorhees Animal Orphanage reached a goal of $1 million towards it capital campaign in constructing a new building, which the non-profit hopes is completed by the end of this year. This rendering shows what the highly anticipated building should look like, according to the VAO. Thanks to a large donation from a Voorhees Animal Orphanage supporter and volunteer, the nonprofit animal shelter has reached the $1 million mark in its capital campaign for a new building at its location at 419 Cooper Road. 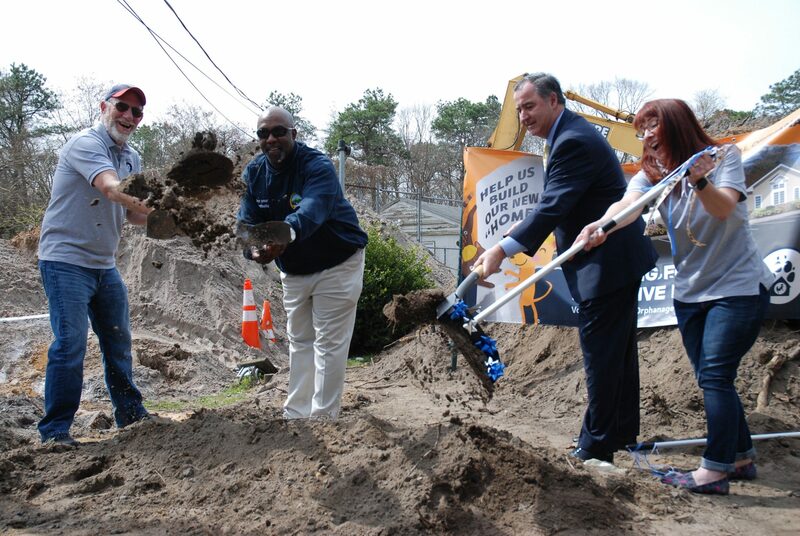 Public officials joined VAO employees and volunteers to celebrate breaking ground on the construction of its new 8,900 square-foot shelter Tuesday, April 9. VAO employees say the new shelter will double the amount of space it has for cats and dogs, thus generating more adoptions. Additional improvements to the upcoming shelter include dog kennels that are 50 percent larger, separate cat and dog meet-and-greet rooms, a larger and more accommodating lobby for guests, much-needed storage space and much more. The groundbreaking ceremony was thanks in part due to the donation of $100,000 by Cherry Hill resident Barbara Partizzi, who told her personal story of how a cat her parents adopted at the VAO changed the lives of her and her parents for the better. Patrizzi’s parents adopted a cat named Bonnie about 10 years ago, with Bonnie immediately clinging to Patrizzi’s mom. After her mom passed away, Bonnie became much more friendly with Patrizzi’s father. Patrizzi then returned home to care for her father about a year ago, and saw the love Bonnie gave her parents during their lives. Patrizzi said animals like Bonnie are waiting to love their future owners at the VAO, and thanked all who assist animals at the VAO for their hard work year-round. Reaching the $1 million mark in its capital campaign for its new building, the VAO was able to break ground, however it is still continuing to raise funds toward its total goal of $1.6 million; supporters and companies are still able to donate via the shelter’s website at vaonj.org/donate/capital-campaign/. VAO officials said the new building will be going up in two phases, with Phase I being the construction of 42 kennels next to the existing building for dogs and cats, which is expected to take approximately eight weeks. Afterward, Phase II will be the construction of the main portion of the building, along with an additional 26 kennels on the opposite side of the kennels built from Phase I. Officials expect Phase II to be complete by the end of the year. Voorhees Township Mayor Michael Mignogna was in attendance to help break ground on the new building and congratulated the VAO for its dedication to improving the lives of animals over the years. “It’s so great that this dream is finally becoming a reality. I’m so proud of the work this organization does.” Mignogna added. Camden County Freeholder Jonathan Young Sr. was also in attendance to congratulate the VAO on moving forward with its new building. The VAO serves as the municipal shelter for 16 Camden County municipalities, including Cherry Hill, Voorhees, Berlin Borough and more, while also serving five municipalities in Salem County.